After sharing a video for the Ariana Grande-assisted "Rule the World," 2 Chainz has now rolled out a clip for "2 Dollar Bill." 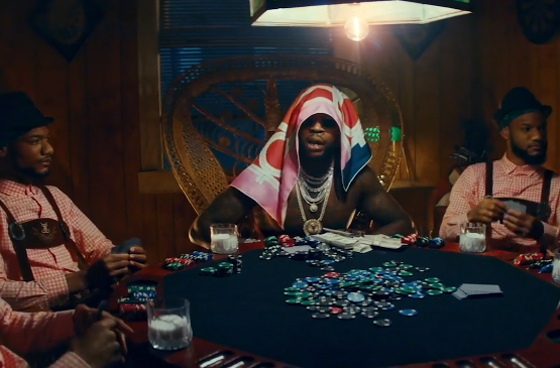 The clip for the Rap or Go to the League cut finds Chainz seated at a poker table, looking to score big against a group of players donning lederhosen. His collaborators Lil Wayne and E-40 also appear in the clip, with the former rapping from under the knife as a team of surgeons pull a gold bar, bong, bonsai tree, golden skateboard and more from inside his stomach. Rap or Go to the League is out now. Read our review of the album. Ryan Hemsworth Gets E-40 and Yakki for "Hunnid"